Tickets for the UCL Centre for Behaviour Change conference are now sold out, however, pre-conference workshop tickets are still available. There will be three pre-conference workshops, all taking place on 20 February 2018. This workshop is a full day event which will include talks and group activities focusing on the role of behaviour change and other theories that support reasoning about the social and community contexts within which behaviour takes place. The focus will be on reducing sedentarism across communities where it’s possible to introduce digital interventions to shape practices. The event will be facilitated by Ann Blandford (UCL) and Anna Cox (UCL). The Keynote speaker is Shailey Minocha (Open University) who will give a talk titled ‘The role of activity monitors in adopting an active and healthy lifestyle’. Other speakers include Stanley Blue (Lancaster University), Jacqueline Mair (Edinburgh Napier University) and Max Western (University of Southampton). You can see the speakers biographies here. You can read abstracts of their presentations here. The workshop will be held at Mary Ward House Conference Centre, WC1H 9SN from 10am until 4pm. The cost for this workshop is £100. By attending, you will have the opportunity to expand and deepen your knowledge of the latest theoretical and empirical approaches to behaviour change interventions and related approaches to address sedentarism, to shape the GetAMoveOn (GAMO) research agenda, and to network with potential future collaborators. This is a full day workshop. The workshop will be run by Rosie Webster (UCL), and Dustin DiTommaso (Mad*Pow/RISD) and participants will learn UX methods to communicate ideas through applying an overarching process with detailed design, documentation and evaluation. There will be individual and group sketching covering the basic shapes and techniques to visualise interface structure and composition and interactions between person and applications (workflow & sequences). The only prerequisite for attending this workshop is an interest in behaviour change. The workshop will be held at Mary Ward House Conference Centre, WC1H 9SN from 10am until 4pm for £106.79. You can get you tickets here. Workshop 3 - ‘Designing Complex Interventions: Exploring the application of behaviour change theory to the design and development of a multi-stakeholder digital tool to support people self-managing multiple chronic health conditions’. This workshop will be held by John Dinsmore (ProACT) and will explore the challenges involved in applying the Behaviour Change Wheel (BCW) to a complex digital health intervention for older persons with chronic diseases/multimorbidity. The workshop will provide participants with the opportunity to interact with technologies developed as part of this H2020 project as well as take part in an interactive session using the BCW and end-user personas to discuss, debate and formulate new ideas for the future development of behaviour change interventions that require change across multiple health dimensions and stakeholder groups. 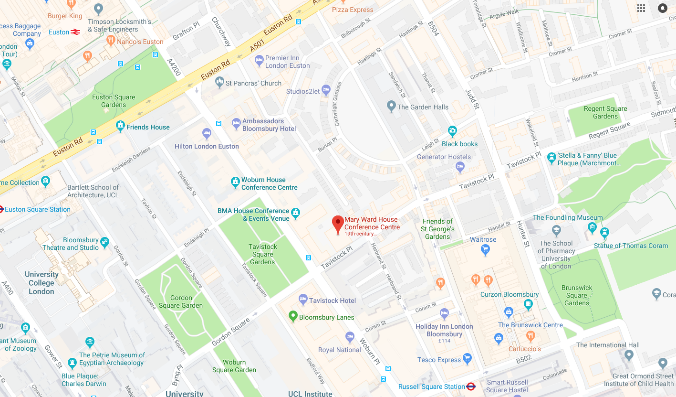 The workshop will be held at Mary Ward House Conference Centre, WC1H 9SN from 10am until 1pm and the tickets are £55 and can he bought here. If you want to attend any of these workshops but are based outside of London, here is a list of recommended hotels.